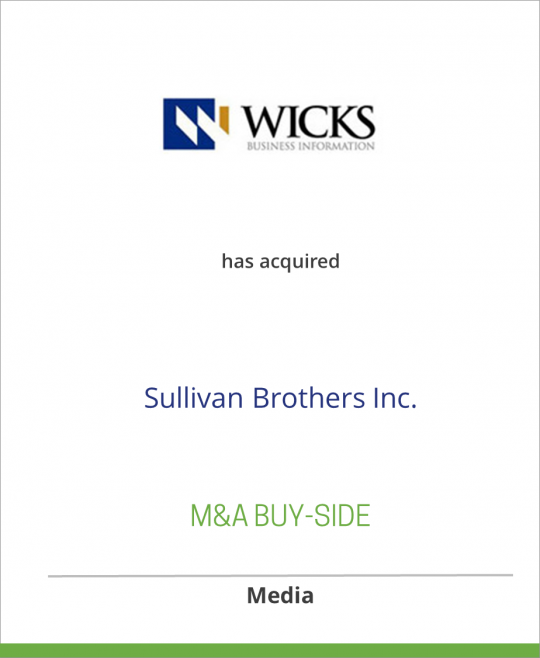 Wicks Sports Information has acquired Sullivan Brothers, Inc.
Sullivan Brothers, Inc., based in Lowell, Massachusetts, has production facilities in Florida, Kentucky and Maryland and Massachusetts. The company produces daily programs for multiple thoroughbred, harness and greyhound racetracks and jai alai frontons along the eastern seaboard. Its clients include Charles Town, Churchill Downs, Ellis Park, Freehold Raceway, Gulfstream Park, Maryland Jockey Club (Laurel and Pimlico), Mountaineer Race Track, Penn National, Pompano Harness, Rockingham Park and Suffolk Downs. Wicks Sports Information, LLC (“WSI”) was formed to acquire and develop niche sports information and publishing businesses. As its initial transaction, WSI acquired the Daily Racing Form (“DRF”), the pre-eminent provider of daily editorial, past performance and breeding and sales information to the thoroughbred horseracing industry. The company has an annual circulation of over 13 million through 30 region editions and is available in more than 7,500 retail outlets and at most major racing venues nationwide. DRF is headquartered in New York City and maintains a significant presence in Lexington, KY. WSI is a portfolio company of the Wicks Group of Companies, L.L.C., is a private equity firm focused on selected segments of the communications, information and media industries. The group was founded in 1989 and is based in New York City.